New Zealand’s Martin Guptill made the highest score in World Cup history with 237 not out against West Indies to send his team into the semi-finals. His 163-ball innings in Wellington featured 11 sixes and 24 fours and beat the 215 made by West Indies’ Chris Gayle earlier in the tournament. Guptill, 28, hit 137 from his last 52 balls to help his side post 393-6. Trent Boult then took four early wickets as New Zealand bowled out the Windies for 250 to seal a 143-run win. Gayle’s 33-ball 61, featuring eight sixes, entertained the crowd as the Caribbean side scored at a furious pace. But they continued to lose wickets at regular intervals and were bowled out in 30.3 overs to spark jubilant scenes in the capital. New Zealand, semi-finalists for the seventh time, will now face South Africa in Auckland on Tuesday at 01:00 GMT, with both seeking a first World Cup final appearance. Guptill’s score was the second best in one-day international history behind Rohit Sharma’s 264 and propelled the Black Caps to the highest total in a World Cup knockout match. Having ended a run of 21 innings without a century in New Zealand’s previous match against Bangladesh, he became the fifth player to make an ODI double hundred. He joined Indians Sharma, Sachin Tendulkar and Virender Sehwag, and Gayle in the exclusive club. His effort was also the fourth highest score in all List A cricket – limited-overs games that are not Twenty20s. 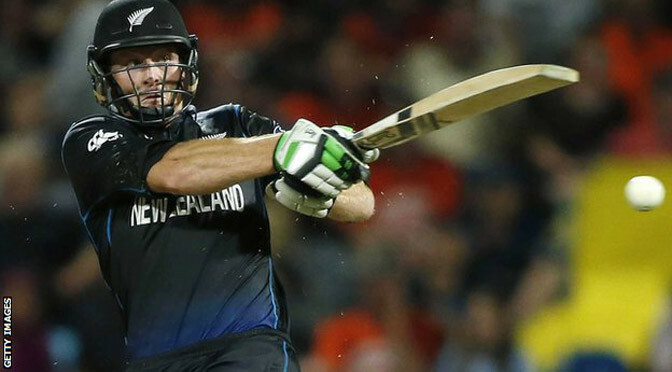 New Zealand recorded their sixth successive win at the 2015 World Cup as they beat Bangladesh by three wickets. Chasing 289 to win, the co-hosts overcame a late collapse to win with seven balls to spare, with Martin Guptill scoring 105, Ross Taylor 56 and Grant Elliott 39. Bangladesh had posted 288-7 in Hamilton as Mahmudullah made an unbeaten 128, his second century in two matches. New Zealand, who remain unbeaten, had already secured top spot in Pool A. The Kiwis, who have lost six World Cup semi-finals, will face Pakistan, Ireland or West Indies in the quarter-finals in Wellington on Saturday, 21 March. They showed why they are one of the favourites to win the competition with a hard-fought victory after they won the toss. In a thrilling finish, New Zealand fell from 210-3 to 269-7 as Bangladesh captain Shakib Al Hasan claimed 4-55, but Daniel Vettori and Tim Southee saw the hosts home after a rapid 39 from Corey Anderson. Defeat means Bangladesh are likely to finish fourth in Pool A, which would mean a quarter-final against Pool B winners India in Melbourne on Thursday, 19 March. Earlier, Trent Boult claimed the wickets of Imrul Kayes and Tamim Iqbal during a hostil opening spell as Bangladesh slipped to 27-2. Mahmudullah, who was dropped on nought by Guptill and on one by Anderson in the following over, followed up his 103 against Englandwith his highest ODI score. He was helped by Soumya Sarkar’s 51 – his maiden ODI half-century – before Sabbir Rahman hit 40 off 23 balls. 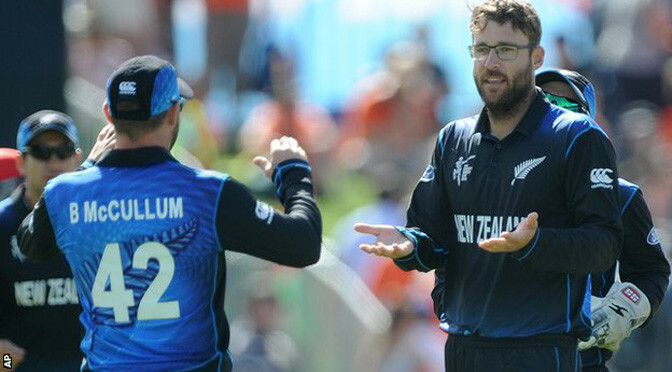 The Kiwis looked in trouble at 33-2 after Shakib dismissed Brendon McCullum and Kane Williamson. However, Guptill, who will play for Derbyshire in this year’s County Championship before New Zealand begin their tour of England, put his side in control by hitting 11 fours and two sixes in his 100-ball knock. New Zealand made it five wins from five at the World Cup as a six-wicket win in Napier eliminated Afghanistan from quarter-final contention. Veteran spinner Daniel Vettori (4-18) reduced Afghanistan to 59-6 before Samiullah Shenwari (54) and Najibullah Zadran (56) helped them to 186 all out. Black Caps skipper Brendon McCullum then hit a rapid 42 from 19 balls. 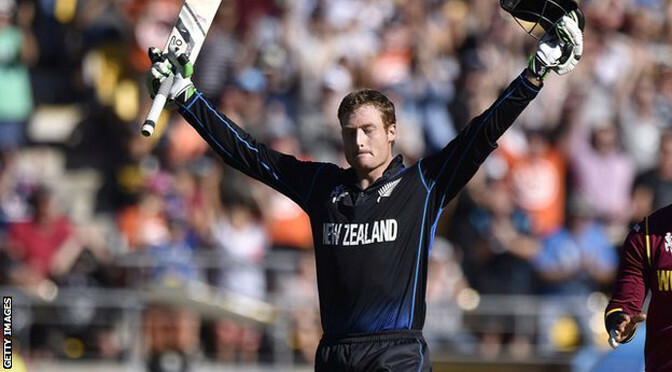 Martin Guptill made 57 as the Kiwis, already in the quarter-finals, cruised home with 13.5 overs to spare. McCullum powered two boundaries in the first over of New Zealand’s reply and by the time his entertaining cameo was ended when he edged Mohammad Nabi onto his stumps via his pads, they were 53-1 in the sixth over and on course for victory. Australia’s 64-run win over Sri Lanka in Sydney later on Sunday confirmed New Zealand as Pool A winners. It looked as though the co-hosts would face a much smaller target thanks to Vettori, who was introduced as early as the third over to allow the opening bowlers to change ends and knocked over teenager Usman Ghani’s off stump with his first ball. After seamer Trent Boult accounted for Javed Ahmadi and Asghar Stanikzai, Vettori returned for a second spell to bowl Nawroz Mangal (27) for the 36-year-old’s 300th one-day international wicket. England suffered a humiliating eight-wicket thrashing by New Zealand as Tim Southee became only the fourth man to take seven wickets in a World Cup match. 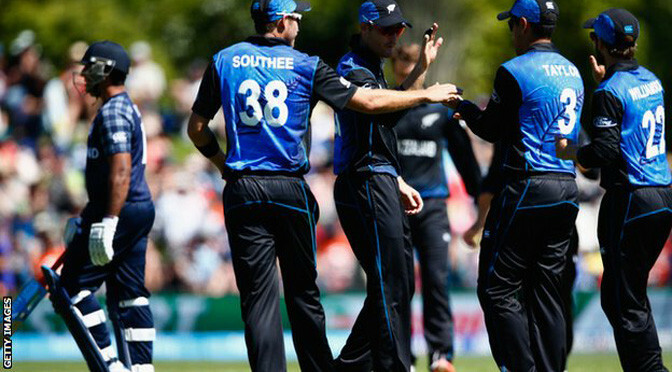 Southee’s 7-33 saw England blown away for 123, the last seven wickets falling for 19 runs. Brendon McCullum then smashed an 18-ball half-century, the fastest in World Cup history, to propel New Zealand to their target in just 12.2 overs. That equalled the shortest ODI chase against England, in a match that lasted just 45.4 overs in total. Only when McCullum was bowled by Chris Woakes for a 25-ball 77 did England avoid the ignominy of being beaten before the scheduled tea interval. A third win in as many games has all but secured New Zealand’s place in the quarter-finals, while two defeats from two means England can perhaps afford only one more from their remaining four matches if they are to qualify. They face Scotland in Christchurch next from 22:00 GMT on Sunday before matches against Sri Lanka, Bangladesh and Afghanistan. Eoin Morgan’s team attracted criticism from the likes of Geoffrey Boycott and Graham Gooch following their opening loss to Australia, but this most one-sided of hammerings was far more abject. Defeats against both co-hosts were probably expected before start of the tournament, but it is the manner in which England surrendered in Wellington that suggests their World Cup is already in disarray. On a blameless surface, they were taken apart by Southee, who was as brilliant as England were woeful, pitching the ball up at good pace and finding late swing. Some resistance came from Joe Root, the last man out for 46, his stand of 47 with captain Morgan the only period of calm in the match. Morgan, who had managed only two runs in his previous four ODI innings, at least made a rather nervy 17, but his needless loft down the ground to be brilliantly caught at long-on by Adam Milne off Daniel Vettori began the carnage. Southee, who had earlier bowled the flat-footed opening pair of Ian Bell and Moeen Ali, ran through the England middle and lower order. James Taylor and Chris Woakes were bowled either side of Jos Buttler edging behind, while Stuart Broad looped a catch to mid-off before Steven Finn was held at first slip. Southee was denied the chance of the first World Cup eight-wicket haul when Root top edged Milne to long leg, ending England’s innings in 33.2 overs. They had to field right away, with McCullum then piling on the misery in a violent assault on a bowling attack that had no answers. He cut the second ball he faced, from Broad, for six, the first of seven maximums carved over the off side. New Zealand made it two wins out of two in Pool A with a bizarre three-wicket victory against Scotland in Dunedin. The Scots were reduced to 12-4 in the fifth over before Matt Machan (56) and Richie Berrington (50) put on 97. Four batsmen fell first ball, a World Cup first, and only the third such instance in a one-day international, as they were 142 all out in the 37th over. But New Zealand had more alarms than expected in a curious run chase, before winning with 25.1 overs to spare. The Scots are in their third World Cup campaign and are yet to win a match in nine attempts, but came closer at the University Oval than anyone could have believed after such a destructive start. They thrashed their higher ranked fellow qualifiers Ireland by 179 runs in a recent warm-up game yet it quickly became apparent they would not be emulating the Irish team’s victory over West Indies on Monday. Facing an in-form New Zealand on their own patch was a rather different proposition to a fragmented Windies, and the co-hosts, semi-finalists six times, justified their position as one of the leading contenders for the trophy with a fine display in the field after winning the toss. Left-arm seamer Trent Boult expertly exploited the conditions, swinging the ball back into the right-handers at pace to claim wickets with his opening two deliveries in the second over. Tim Southee also struck with consecutive deliveries and there was concern the lowest World Cup total of 36 by Canada was in jeopardy. But Sussex left-hander Machan played with calm assurance in a 79-ball innings to restore some respectability with the purposeful Berrington. However, wily spinner Daniel Vettori wrapped up the innings with successive wickets and the Kiwis had almost 40 minutes of batting before the official lunch interval. Skipper Brendon McCullum and opening partner Martin Guptill appeared to want to reach the target in the nine overs bowled before the break, with number of wickets lost not affecting a team’s overall run-rate in the group table, and both were caught behind in the mini-session. The prolific Kane Williamson top-scored with 38 but edged seamer Josh Davey in the 18th over, one of four wickets to fall for 31 in a surprisingly ragged batting display from the Kiwis, who next face England in a day-night fixture in Wellington on Friday. Scotland captain Preston Mommsen said he was “very proud” of his side after they ran the co-hosts so close. Scotland’s next match is against England, in Christchurch on Monday. Co-hosts New Zealand got off to a winning start with a resounding 98-run victory over Sri Lanka in the opening match of the World Cup in Christchurch. Captain Brendon McCullum struck 65 off 49 balls as the Black Caps put on a rapid 111 for the first wicket. Kane Williamson added a composed 57 before Corey Anderson blasted 75 off 46 balls to help the hosts to an imposing total of 331-6 from their 50 overs. In reply, Sri Lanka subsided to 233 all out, with Daniel Vettori taking 2-34. New Zealand, who play England next, have reached six World Cup semi-finals without ever going on to make the final. The Black Caps, however, are one of the favourites for this tournament, and this powerful performance against the 2011 finalists underlined why they are so highly-rated. Put in under grey skies, the hosts immediately attacked the Sri Lanka bowlers with some explosive hitting in the first powerplay. Williamson recorded his 13th fifty in his last 17 ODIs, before Anderson, playing in his home city, helped New Zealand to add a crucial 102 in the final 10 overs. Sri Lanka won the World Cup in 1996 and reached the final of the last two tournaments, but they will have to improve on this performance in order to challenge at this tournament. Influential fast bowler Lasith Malinga was disappointing, conceding 84 runs in 10 wicketless overs. Sri Lanka’s chase began well, with opener Lahiru Thirimanne hitting 65, but was soon derailed by the pace of Trent Boult and the spin of Vettori. They collapsed from 124-1 to 168-6, with Boult, Adam Milne and Vettori, who reversed his retirement from ODIs last year, capturing two wickets each, and their innings never recovered. They will hope for a rapid return to form when they face Afghanistan on Saturday. “They probably scored 30 or 40 runs too many and then we needed someone in our top four to get a hundred,” said captain Angelo Matthews. 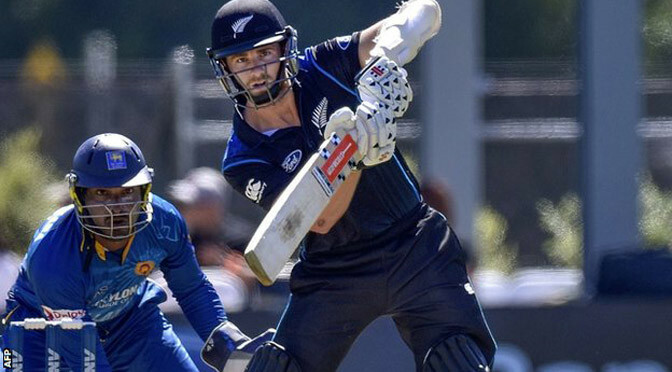 New Zealand claimed the one-day series with Sri Lanka, taking an unassailable 4-1 lead with a 120-run win in the penultimate match in Dunedin. Kane Williamson (97) and Ross Taylor (96) hit two sixes apiece during a stand of 117 in 123 balls as the Kiwis posted 315-8 having opted to bat first. Kumar Sangakkara (81) made his 93rd one-day international fifty but fell in the 38th over, the eighth wicket to go. Sri Lanka were all out soon after for 195. The final game is on Thursday. It was an emphatic victory for the Kiwis, who meet the Sri Lankans in the opening match of the World Cup on 14 February. Williamson was badly dropped on 27 by Tillakarate Dilshan at short cover and reached fifty from 60 balls, but he was denied a sixth ODI century when he was run out after finding himself at the same end as Taylor when in pursuit of a second run. Corey Anderson added 40 in 28 balls and hit three fours in an over from seamer Thisara Perera that cost 19. Taylor struck sixes in consecutive overs before he was trapped lbw on the toe in the 47th over, but his team compiled the second highest total at the University Oval, to follow the record they set in the previous match. The Sri Lankans made a solid start, reaching 55-0 after 12 overs before Dilshan and opening partner Lahiru Thirimanne departed in successive overs. Sangakkara reached fifty from 39 balls, but having struck successive boundaries off left-arm seamer Trent Boult he got a leading edge and spooned a catch to mid-on, as New Zealand took control.